The size of my blocks (and the realities of life) mean that I live with a print in process for some time. My thoughts and feelings about it are informed by what goes on even outside of my studio life. Last weekend I attended a memorial service where one of the passages that was read was from the King James version of the Book of Amos (5:24) It reads: “But let justice run down as waters, and righteousness as a mighty stream.” Even if you are not familiar with the Bible, you will recognize the passage from Dr. Martin Luther King’s use of it in his famous “I Have a Dream” speech. As I printed the last layer of ink yesterday, I simply could not think of any other title but this one. Change. This is what Dr. King was exhorting the assembled crowd to work toward…to expect. 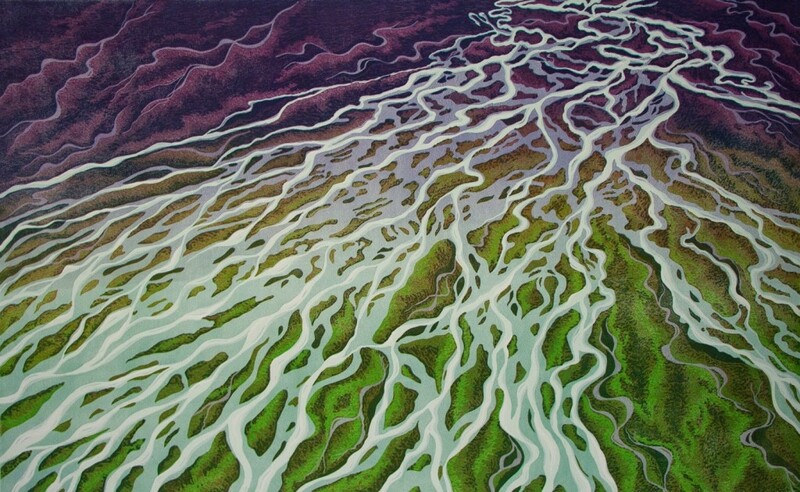 The image of these glacial braided streams cascading over a landscape gave me the feeling of being washed, polished, even abraded as life proceeds. We all are shaped by change, whether from growth, illness, sadness, or renewal. It is inevitable. Nature doesn’t evaluate change as it happens, it just occurs. But I can’t help thinking that some of the natural changes today are linked with our human actions. In our rush to make our lives on earth as comfortable and as lengthy as possible, what are we doing to the natural systems that surround us? With more heavy rainfall and unexpected flooding forecast for the Midwest, I pray that we might take Dr. King’s message to heart, examine our actions, and consider our own roles in the natural processes of change. Otherwise the very glaciers that create these magical braids will simply disappear. Love it! And all the thoughts that go with it. We humans have a lot to answer for, and unless you have a starship hovering on the other side of the sun, we had better change our ways soon.